Dupré Logistics needed an effective yet non-intrusive way to improve safety for 800 drivers without reducing driver productivity or increasing net costs. Dupré Logistics LLC designs and delivers safe, diversified solutions and services for quality-focused clients committed to increasing their competitive advantage. Dupré has more than 1,000 team members. For Dupré Logistics, the level of safety achieved by its drivers is directly tied to the level of profitability achieved by the company. After a wide search, Dupré Logistics selected GreenRoad for driver safety and fleet performance. Initially the company implemented their entire fleet using a phased approach. GreenRoad sensors detect 150 high risk manoeuvres in several categories. Each driver receives real-time, in-vehicle feedback. Dupré’s management accesses web-based reports on each driver’s performance, so driving Behaviours can be tracked over time. This in turn allows the company to provide efficient, targeted training as needed. Drivers’ scores initially improved 30 percent with their first set of drivers. After which Dupré implemented the GreenRoad system on all of its vehicles. For any real-world business, “safety at any cost” is not a realistic option. New technologies aimed at boosting safety must also be affordable and cost-efficient. According to Mr. Voelkel, GreenRoad made sense at all levels. Within a short time of rolling out GreenRoad across its fleet, Dupré Logistics significantly reduced accidents in all categories (rollovers, rear-ends, lane changes, intersections and minor accidents). The company has nearly eliminated risky driving Behaviours, thanks to a combination of GreenRoad’s in-vehicle feedback and targeted coaching. 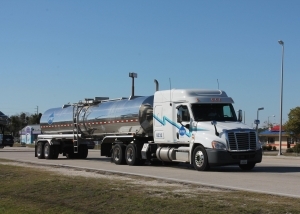 Dupré Logistics also improved fuel efficiency well beyond the .3 miles/gallon mandated by the Board of Directors.